If you want to know more about the concept of “clean eating,” the editors of Clean Eating magazine are the folks to see. I subscribe to their magazine on my iPad, and own all three of their “The Best of Clean Eating” cookbooks. 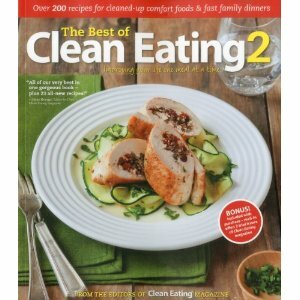 But “The Best of Clean Eating 2” takes first prize, hands down. I cook from it more than any other cookbook in my collection, clean or otherwise, and have made quite a few recipes more than once. Our favorites: Curried Chicken with Peas, New Potato and Turkey Skillet Supper, and Thai Chili (with bulgar in lieu of meat, and sweet potatoes!). You can also find clean recipes — for free — on the Clean Eating website.